We know the grueling world of professional gymnastics isn't all sunshine and rainbows, but between the glittery leotards and those gorgeous acrobatic flips through the air, it seems pretty darn close. But, after we chatted with Dominique Moceanu, '96 Olympic gymnast and member of the only women's gymnastics team to ever win team gold, we found out there's a whole lot more going on than what meets the purple eyeshadow-covered eye. 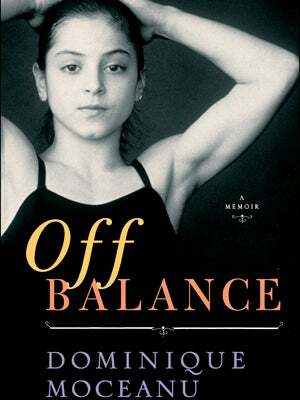 In her memoir, Off Balance, Dominique not only discovers she has a secret sister born without legs and was given up for adoption, but finds out that her once-estranged sibling also became a gymnast after being inspired by Moceanu's Olympic performance — all without knowing they were related. Incredible and insane, sure, but for gymnastics fans, that's not the most shocking part of the book. The former Magnificent Seven member, who for many of us is easy to recall as that tiny 14-year-old girl waving from the podium, puts famed coaches Béla and Márta Károlyi on blast for their allegedly abusive methods of coaching she experienced as a child while training for the Olympic Games. As Team USA competed for its second women's team gold today, the former competitor offered up some input about the state of gymnastics and her thoughts on the way it's being run. From humiliation and being singled out to training for months on an untreated fractured tibia, Dominique experienced one hell of a ride. And, according to her, that friendly mustachioed man who hops on screen every four years at gymnastics meets might not be so friendly, after all. Your memoir is shocking. Were you scared to say some of what's in your book? "I knew in my heart if I was going to write a memoir. I had to bring it, and not simply talk about my highlights and paint over the ugly parts. I thought that I owed it to the fans, and I owed it to the gymnastics community to put it out there, to spark dialogue, and for people to know the reality and the truth because so many people are afraid to speak out. It's very political. We need to raise questions [about] gymnastics programs at the elite level ... because right now, there's a lot of methods that are, which appear to me, un-American." What sorts of methods are those? "When you're giving Márta Károlyi, the national team coordinator, pretty much all autonomy and unchecked power, I think that's dangerous. There are no repercussions and there's no accountability when you do that. So, a lot of people feel that it is a lot like a dictatorship, especially those on the inside, but many people will never say that publicly because they're too afraid." Do you see other gymnasts today who seem to be going through the same issues and struggles that you personally faced? "My situation was a little different. I was Romanian and I'm sure that had to play into the situation with the Károlyis; they used that to their advantage and used my father in sentimental ways and his violent behavior to their advantage. But, I think there are undertones still of the old Károlyi ways and methods in the women's elite program ... U.S.A. gymnastics puts them front and center in every televised major gymnastics event, and I think that takes away from the sport, rather than putting past Olympic champions and putting more of them in the analysis position. I think making them the headline and the main focus of every gymnastics broadcast is not a good thing for our sport." What would you say is the biggest issue you have with U.S. gymnastics these days? "I think you cannot have people in charge who have a history of abuse and abusive methods toward their athletes. I think that is dangerous. Abuse is defined as the "improper use of power," so when you're threatening someone with that power — especially these young, vulnerable, pre-pubescent teens — we should be cautious as to who is influencing them and what kind of power they have. I don't think ethical coaches and ethical people use intimidation and humiliation as a method to achieve success." Tell me more about your thoughts of gymnastic training camps. "They practice a win-at-all-cost method, and training through injuries and over-training methods are still examples of things that occur today. Certainly, injuries are part of gymnastics, but I think the overused ones and the occurrence of them happening so often with those national team training camps is what should raise a question mark. A lot of times these athletes push themselves, and the coaches push their athletes harder at those camps to try and impress Márta Károlyi. I'm not against camps; I think quarterly would be healthier. It would be not as much stress on the body every month to go to the camp and try to outperform yourself every time. ... I think it could just be structured a little better and a little differently." I noticed a lot of gymnasts around trials and before then battling injuries, such as Alicia Sacramone ('08 Olympic gymnast who returned to trials but wasn't chosen for the team). Is that related? "She tore her Achilles at last year's world championship, so that was because I believe she didn't take the measures that were necessary. It had been bothering her for eight months, but it wasn't being addressed like it should have, I don't think ... [and] Márta was already writing her off after the world championships. She said in an interview [that] my husband and I did with her from [there], 'Well, we're breaking in the new generation, and sometimes these older ones, this is their time, and it's up and they get injured.' She had basically written her off, but they let her be kind of strung along through the process." "Because Alicia was so dedicated and determined, she made an outstanding comeback within only nine months, and she really did an excellent job at trials. But, I think she was one of those girls that, you know, they let her go through but they weren't planning on putting her on the team, which they evidently showed that at Olympic trials, and that was unfortunate." After what happened with reigning world champion Jordyn Wieber not qualifying for all-around individual finals over the weekend, do you have any insight as to what she might be going through? "Well, she's certainly heartbroken, I mean, the devastation showed on her face. It's very tough to set that aside, but what's most important is you have to leave your individual goals behind you and go for the team. She didn't expect to be the one that didn't qualify in, but Aly Raisman had an incredible day, and I just don't want this to take away from her victory also, because she did a great job! Nobody should be disappointed except the coaches, who pit them all against each other. If the coaches didn't want that to happen, they should have only put in two all-around girls competing to qualify." How hard is it to compartmentalize those feelings? "As much as it's devastating, you have to remember that the team comes first, and the individual gold comes second. A lot of people [find] it shocking because of the way the media has been playing it out, but if you're truly knowledgable about gymnastics, you understand this was a real possibility. And, you cannot take away anything from Aly at this time because she shouldn't feel guilty for making it into the all-around finals"
"In order for the team to have camaraderie and cohesiveness, they have to set aside their individual differences right now and focus on the team, or else we're going to see some uncharacteristic things happen in the team final. Surprises always happen at the Olympic Games, and that's part of the spectacle of it all." "Off Balance: A Memoir" By Dominique Moceanu, $15.23, available at Amazon.